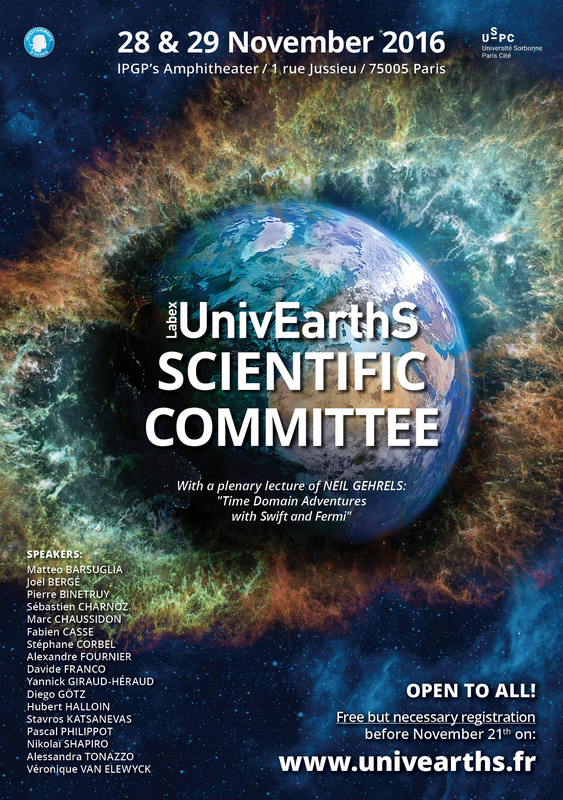 The Labex UnivEarthS is pleased to invite you to its sixth scientific committee, to be held on Monday 28 & Tuesday 29 November 2016 in Paris. The leaders of the 18 UnivEarthS projects will present the advances of their work, on subjects as varied as the formation of planets, the development of tools for space, or the evolution of life on Earth (visit the page of all projects). We will also have the honor to attend a conference given by Dr. Neil GEHRELS, director of the Astroparticle Physics Laboratory, NASA / GSFC, and member of UnivEarthS scientific committee, on “Time Domain Adventures with Swift and Fermi “. The Scientific Council is OPEN TO ALL with registration (free but required) before November 21, 2016. The presentations will be open to the public all day Monday and Tuesday morning. The session on Tuesday afternoon will be reserved for members of the Scientific Council and therefore closed to the public. Download the program on PDF file. To register, please fulfill the registration form. Registration is free but required, and must be completed before 21 November 2016. Please note the registration is still open and this list will evolve. The scientific committe will take place in the amphitheater of the Institut de Physique du Globe de Paris, at 1 rue Jussieu 75005 Paris.